On a rainy winter night in Mexico City, a ten-member wedding party is kidnapped in front of the grooms family mansion. The perpetrator is a small-time gangster named El Galan, who wants nothing more than to make his crew a major cartel and hopes that this crime will be his big break. He sets the wedding party's ransom at five million US dollars, to be paid in cash within twenty-four hours. The only captive not related to either the bride or the groom is the young Jessica Juliet Wolfe, a bridesmaid and close friend of the bride. Jessie hails from a family of notorious outlaws that has branches on both sides of the border, and when the Wolfes learn of Jessie's abduction, they fear kidnappers will kill the captives after receiving the ransom-unless they rescue Jessie first. 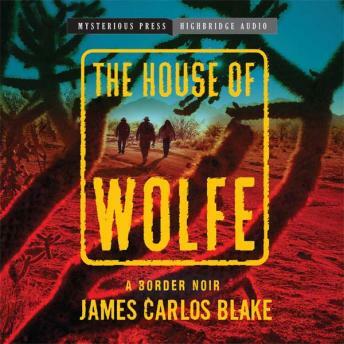 Gritty and exhilarating, The House of Wolfe takes readers on a wild ride from Mexico City's opulent neighborhoods to its frenetic downtown streets and feral shantytowns, as El Galan proves how dangerous it is to underestimate an ambitious criminal, and Jessie's blood kin desperately try to find her before it's too late.